Wayanad has a salubrious climate. The mean average rain fall in this district is 2322 m.m. 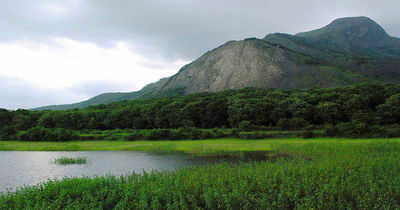 Lakkidi, Vythiri and Meppadi are the high rainfall areas in Wayanad. Annual rain fall in these high rain fall areas ranges from 3,000 to 4,000m.m. High velocity winds are common during the south west monsoon and dry winds blow in March-April. High altitude regions experience severe cold. In Wayanad (Ambalavayal) the mean maximum and minimum temperature for the last five years were 29oC and 18oC respectively. This place experiences a high relative humidity which goes even up to 95 per cent during the south west monsoon period. Generally, the year is classifed into four seasons, namely, cold weather (December-February), hot weather (March-May), south west monsoon (June-September) and north east monsoon(October-November). The dale, 'Lakkidi', nestled among the hills of Vythiri taluk has the highest average rainfall in Kerala.The average rain fall in Wayanad is 300mm. per year. There is a decreasing trend in rainfall in this area. The average rainfall data shows that the lowest rain fall received from north east monsson, is in Wayanad district. The flora of Wayanad are characteristic of the Western Ghats and the plantation crops grown in the cool climate. A major portion of the district is covered by coffee. Trees of the wild type like rose-wood, anjili (Artocarpus), mullumurikku (Erthrina), several species of caussia and many other non-descrip varieties are still preserved here and there, to give shade to the coffee plants. These trees give a dembalance of wilderness to the landscape of Wayanad. In a majority of coffee plantations, the age-old species are replaced by the silver-oak which is suited to the cold climate. This tree grows quickly and its cultivation is widespread among coffee plantations for shade and for giving support to pepper. It is used for the plywood industry and thus is economical to the farmers. Eucalyptus grandis, a shorter variety of eucalyptus, whose fragrant smell suffuses the very air around it, is cultivated on a large scale in centain parts of the district. Eucalyptus oil is extracted on commercial basis from its leaves. Of the 20,864 hectares of reserve forest, the major portion is teak plantation. Arecanut palms and jack trees are also grown here. Tea is grown as an industry in large estates. The soil and climate of Wayanad are suitable for horiculture on commercial basis. For promoting the cultivation of vegetables and raising of orchards, the Kerala Agricultural University is running a Regional Agricultural Research Station at Ambalavayal. 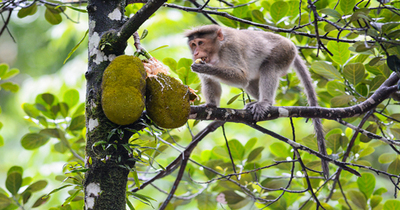 With the clearing of forests, the diverse and buzzling animal life, characteristic of the forests of Western Ghats, has vanished from Wayanad. One can still see the bonnet monkeys, loris, mongooses, jungle cats, squirrels, jackals, hares, etc. in the limited forest areas. Elephant, bear and other wild animals from the neighbouring wild life sanctuaries of Karnadaka and Tamil Nadu, stray into the Begur forest range and the forests around Muthanga, which is 20 kilometres away from the town of Sulthan Bathery. 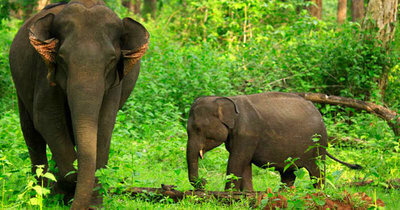 Wayanad as blessed with wilderness as Malabar will also be equally blessed with wildlife. Not only is Malabar home to wildlife reserves like Silent Valley and Muthanga Wildlife Sanctuary, it is also within easy reach of sanctuaries outside the state. Established in 1973, the Wayanad Wildlife Sanctuary is contiguous to the protected area network of Nagarhole and Bandipur of Karnataka on the northeast and Mudumalai of Tamil Nadu on the southeast. Rich in bio diversity, the sanctuary is an integral part of the Nilgiri Biosphere Reserve , which has been established with the specific objective of conserving the biological heritage of the region. The sanctuary is rich in flora and fauna. The management lays emphasis on scientific conservation with due consideration for the general lifestyle of the tribals and others who live in and around the forest. Elephant, spotted deer. Bison, tiger, cheetah, wild bear etc. can be spotted here. Elephant rides are arranged by the Forest department. 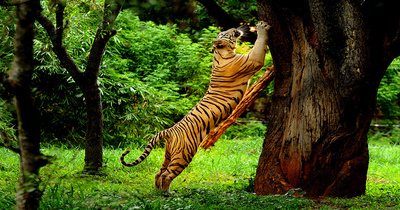 Situated in Karnataka, this wildlife sanctuary is some 40 kms from Mananthavady in Wayanad. Jeeps and trucks regularly transport visitors to this location. 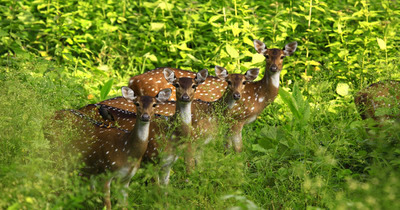 Begur/Tholepetty Wildlife Sanctuary: Several species of animals like elephant , bison, spotted deer, tiger, leopard, bear and wild boar are found in this sanctuary , which is just 100 kms from Vythiri. The best season to visit is Dec-to May, when animals from the neighbouring Bandhipur, Nagarhole and Mudamalai frequent this sanctuary due to scarcity of water elsewhere. 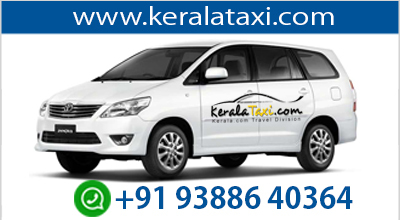 Day trips are organized from various resorts in Wayanad. Situated in Karnataka , this famous wildlife sanctuary and tiger reserve is also easily accessible from Malabar and is en route to Ooty. Mudumalai Elephant Park: Tamil Nadu's most well-known wild life sanctuary is within easy reach and is just 130 kms from Vythiri. This sanctuary in Karnataka state extends over 643.39 sq.km. The park houses diverse species of plant and animal life. Visiting time:0600-0800 hrs and 1500-1730 hrs. This sanctuary is home to many exotic species of fauna. A rare blue beard bee-eater a rare bird has been sighted in Wayanad. The blue bird bee-eater is the largest bee-eater in the world. This rare bird builds nests on the ground and usually dwells in forest especially low land forest clearings and open hill forests. The bird has pale blue forehead and a "beard". The upper parts of the head are green and the belly adorned with soft streaks. The long tail is yellow below and square ended. The bird has de-curved slender black bill and short wings. Its call is audible from a good distance. Before feeding the young, the bird gives a special kind of call to its young ones, perching on a nearby tree as if signaling them to come to the entrance of the nest to receive the food. 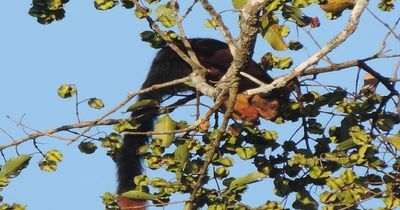 The nests are found to be almost two and a half meter long inside, a peculiar to this species. The nest and the chicks are highly vulnerable to attack of snakes. Out of the 24 species of bee-eaters seen in the world, six have been spotted in India. Bee-eaters play a major role in controlling insect pests, especially wasps, which are poisonous.